Well, ok, it's not that different. Today I have a philosophy essay instead of theology! Woohoo! Comparing the political philosophies of Plato and Augustine, it was for the subject "Ancient Philosophy". Enjoy! PS. This is actually my fastest ever essay. Usually they take me at least a week, this one was done in two days! Speed demon! Discuss, compare and contrast the political philosophies of Plato and Augustine. Plato and Augustine are two towering figures of Ancient Philosophy, connected in thought in that Plato greatly influenced Augustine, mostly through Neo-Platonism. In terms of political philosophy, Plato’s central concern is what a just society is, and how to bring one about, while Augustine is concerned with where individuals are ultimately destined, depending on what they choose to love, as this choice of love also affects the functioning of society on earth. Different though these foci are, they nevertheless are both centred on what best enables a human being to flourish, according to his nature, which yields some further similarities. Given that human nature is unchanging (cultural environments are what change over time), their insights still have relevance for the workings of contemporary society. In the Republic, Plato proposes his blueprint of the ideal state. The state as an institution is essential because human beings need to work together to meet their material needs, but also, more fundamentally, because man is social by nature and can therefore only live an excellent life “in and through the political community.” For Plato, the men suited to ruling are those who have true knowledge of the good, and hence, true wisdom, enabling them to be good. The ideal state, or Kallipolis (‘Beautiful City’), as it is called, operates on a three-class structure, consisting of the Guardians, Auxiliaries and Producers. The Guardians are to be well-educated, for it is from them that the Philosopher-King is to come. They must learn to recognize the Forms, and thus be enlightened by Truth, and attain wisdom, because having come to know the good they become good. Plato had a rational concept of good, which rendered it inaccessible to the unintellectual, the uneducated, and hence, also the poor. Each of the classes embodies a particular virtue, and for the Guardians it is prudence, or “application of the eternal universal truths to particular cases in the field especially of government and social life.” As a consequence of his wisdom, the Philosopher-King ought to have a number of other characteristics which include- he ought not to desire to rule (so that the power hungry do not gain a position that they may abuse), yet he must also be willing to take on this burden for the greater good of society, as by virtue of his privileged knowledge, he has a duty to the community. The Guardians must also live according to a certain prescribed lifestyle, grounded in a precautionary attitude against common pitfalls of human nature. For example, man’s love for personal property has the potential to break up the ideal state. However, not all men are capable of living in a completely detached manner. Thus, Plato imposed a rule on the elite Guardians that they were to possess nothing, even to the point of removing the idea of the family- men were made to hold their wives and children in common. The Auxiliaries and the Producers are in many ways second class. The Auxiliaries function as the military class, and as such they ought to exemplify courage, or fortitude. The Producers’ role is to conform to the rule of the Guardians; hence, they must practice temperance. To keep this order, Plato holds it may be necessary for the Guardians to perpetuate a “noble lie”, namely that the Guardians, Auxiliaries and Producers have an inherent hierarchy between them due to the natures of their souls- they possess gold, silver and bronze souls respectively. The expected result of maintaining this order is that justice will prevail. Every small detail of his political thought is concerned with contributing to furthering the actualisation of justice. 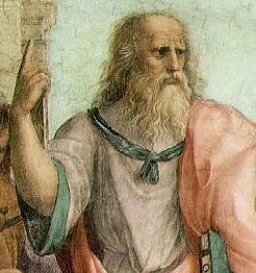 For Plato, justice consists in each individual performing the role to which they are best suited, thereby ensuring the good of the whole community. There is an evident shift in focus in Plato’s Statesman and Laws from the ideal state outlined above. In the Statesman, Plato still regards the Philosopher-King as the ideal mode of ruling, but he recognizes that such a man is unlikely to ever be found, probably due to his failed attempt to prepare Diogenes for this task. The second- best governmental structure is then a group of diligent rulers who act within a framework laid down by law. These rulers do not have true knowledge, but true belief can be arrived at through wise laws, and this situation is preferable to arbitrary opinion. What, exactly, these wise laws are, and from where they are to come, is left obscure. This mystery is unveiled in the Laws, which proposes many concrete laws. Essential to these propositions are the preambles to each law and punishment consequent to its being broken, which expound Plato’s reasoning behind them, with the intent to persuade the reader that these laws really are in the best interests of the common good. Plato shows much concern about any potential change in the ideal state, once established. Many of his highly precise instructions are written with the objective of preventing change for as long as possible, because for Plato, all change is decay. Stability is crucial, and change is the antithesis of stability. This is connected with his notion of the unchanging, eternal, perfect Forms, since he likely considers the ideal state, especially in the Republic, to be the Form of the state, which all earthly states participate in. To be as much like the Form of the state as possible, is to strive be the best a state can be, and thus change is not something to be tolerated. Augustine adopts a minimalist position regarding the basic definition of a state. For him, the following two things are necessary: “there must be a group of human beings who are capable of making a free choice, and they must in fact be bound together by agreement about common goals.” The criterion by which the goodness of a particular state is judged resides in what exactly its common goals are. Unlike Cicero, Augustine does not include “perfect” justice in his definition, simply because, based on his understanding of what constitutes perfect justice, combined with the inevitable weakness of humanity, there never has been nor will there ever be a state in possession of perfect justice. For Augustine, the chief purpose of the state is to preserve “the well-ordered concord of civil obedience and rule,” namely, peace. Only with the establishment of peace can the state then attend to the management of those material goods necessary to sustain life. 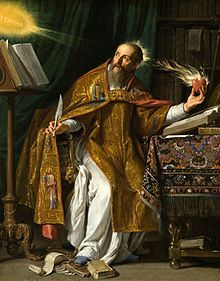 This peace, however, is not true peace, as it is temporary and precarious, and therefore of little value to Augustine. True peace has its origin in the harmony of man with God. Interestingly, Augustine seems to think that preserving this peace and order does not extend to providing for those who cannot provide for themselves, and that such provisions should be left to the Church and to individuals. Augustine is of the view that all men are members of one of two cities- the City of God, and the City of Man. The City of God is comprised of those chosen by God, as a free gift in His mercy, to receive His grace that enables them to truly love God before themselves. They are known as the Elect, and are characterized by love of God, even to the point of contempt of self. All men who are not of the predestined, in God’s justice, are members of the Earthly City, or the City of Man, and are characterized by love of self, to the point of contempt of God. The City of God is not a physical or temporal society. On earth the two Cities co-exist, as each person is a member of one of the two Cities, and will remain so until the Final Judgment. However, it is not known who precisely is a member of the City of God, rendering the two cities quite intermingled. Thus, although the City of God has often been identified with the Church on earth, it in fact consists in the Church as it will be at the end of time, while the Church on earth contains members of both cities, just as all states do. These two Cities, while objective realities separate from individual states, also function as two ends of a spectrum measuring the degree of perfection for all possible states. While no society or state is entirely either the City of God or the City of Man, “all political societies can tend towards being a Babylon or a Jerusalem.” The perfection of any society is determined by the appropriateness of what goods each of its members love. Thus, every state fails to live up to the ideal of perfect love of God and of neighbour. It does, however, provide hope, that through the interior transformations of individual members of a political society, that society may progress a little closer to the ideal. An important question to consider is whether Augustine regards the state as a natural or an unnatural institution. It seems that he thinks that political authority exists only as a result of original sin. Prior to the Fall, humanity lived in harmony with God, that is, in true peace. This correct ordering of loves, with God first and self second, would of itself have maintained the social order. After the Fall, humanity forgot what it was like to possess true peace, and in a proposition very similar to Plato’s theory of anamnesis, individuals now have to go through a process of coming to know God again and rediscovering that peace. All too often, however, people are satisfied with merely seeking the earthly kind of peace, namely, lack of conflict, which original sin has left humanity with a tendency towards, contrary to their original nature. This conflict can only be kept in check though political rule, acting as a “corrective for human perversity.” Thus, the state is “natural,” in the sense that it is universal, but not in man’s nature as God originally intended him to be. A number of similarities in the political thought of Plato and Augustine have come to light in the above examination. These consist in the principles that underlie their more specific ideas as to how societies play out concretely. Both philosophers thought of true justice as being in the heavens, not to be found on earth- Plato in the form of justice present in the realm of forms, and Augustine s only being present in the heavenly City of God. They both attribute earthly goods as being lures that corrupt- for Plato, it is wealth, which is why he is so intent on removing temptation from the ruling class. For Augustine, it is power. Their understandings of what the purpose of the state is for are essentially identical, as Plato sees it as allowing material needs to be met as well as establishing an environment that encourages the flourishing of the social aspect of human beings. Augustine frames the latter in terms of peace, which allows for the former to take place. Several interesting parallels exist between Kallipolis and the City of God. Firstly, regarding the Philosopher-King, the true King of the Heavenly City is God, who really is perfect in every way, and knows what is best for its members, as He is the Creator. He not only knows what Goodness, Truth and Beauty are, He is the fullness of each of them. The rules imposed by Plato of no personal property, no family, there will only be one religion, will also exist in heaven, not as impositions but merely by virtue of what heaven is. The suggestions of censorship and a rigid educational curriculum are for the purpose of guiding people to the truth, and to know what is best for them. In the City of God, people will be one with Truth itself, having freely chosen to love and obey God, cooperating with His grace, and thus will be of one mind regarding truth. The significant difference, however, is that Plato suggests a number of methods of forcing these ideas to be adopted, while being in the City of God and having true love, knowledge and peace are freely chosen. A significant difference between Plato and Augustine’s political thought lies in what they each consider to be underlying the structure of society that binds it together. For Plato, this bond is the virtue of justice, while for Augustine, it is love. These qualities are what order both society as a whole, and the individuals within it to their proper ends. Plato sees justice as existing when each individual is performing the function within society proper to him, contributing appropriately to the good of the whole. This contributes to his personal flourishing, as well as to that of the rest of the community, and thus is ordered towards the good. For Augustine, what a person loves will determine what he does, and so is prior to one’s contribution to society. Inward-focused love is ultimately self-destructive, while love of God first is what we were made to love, and thus are fulfilled if our loves are ordered correctly. These loves are the essential differentiating factor between the two Cities. Both Plato and Augustine certainly have a strong conviction that what is good for man is objective, by virtue of the reality of what human nature is. This was what framed their thinking on the state and society. Different ideas about human nature will lead to different ideas about the purpose and functioning of states, and as such this principle has significance for contemporary society. Relativism is prevalent in today’s society, which is currently affecting how politics works, as well as leading to changes in social, moral, legal and cultural norms, which, more often than not, are detrimental to the common good. Society would therefore do well to return to a well-grounded understanding of the human person, rejecting the relativism that is similar to the Sophistry that Plato despised. In conclusion, the political philosophies of both Plato and Augustine are grounded in their understandings of human nature as it is, and how it came to be that way. Plato sees humanity as needing to get back to the Forms, in terms of both knowledge and locale, and the state has an important part to play in that journey. Augustine sees humanity as needing to get back to God, recognising Him for who He is and responding appropriately, so as to spend eternity with Him. This response should be one of love of God rather than ourselves, and which one of the two that we love determines whether we are a member of the City of God or the City of Man. Furthermore, what society loves as a whole will determine whether the society is more like the Heavenly City or the Earthly City. There is thus some degree of similarity in their underlying concepts; however, their discussion of particular details differs, due to their experience of different political and social climates.